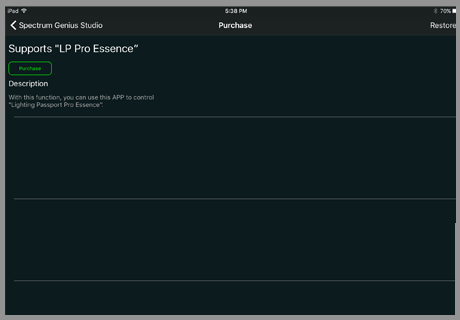 ' Studio App Manual - National Photonic Ltd. Locate your Lighting Passport and ensure that SGS is loaded on your smart device. (2) Ensure that the slide cover located on the upper back of the LP is closed and that the slit on the top is covered by the black protector. (3) Turn on the LP by sliding the power button is on the left side of Lighting Passport downward and ensure that the blue indicator on the back lights up. (4) Open the SGS iPad APP by tapping the icon on the iPad screen. (1)	When using an LP with SGS for the first time, if more than one LP is in close proximity, all available LP serial numbers [S/N] will pop up in the selection list on the screen, Please choose the serial number you want to connect to. (2) Provided this LP is available, future connections will be made automatically. (3) If you want to connect to a different device, please go to BLUETOOTH PAIRING in SETTINGS. 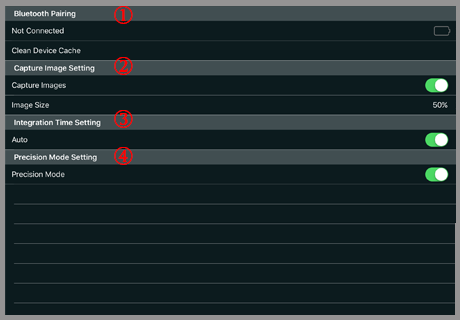 (4) Each time an LP is switched on, it does a AUTO DARK CALIBRATION. This is why the protective slide cover should be closed. 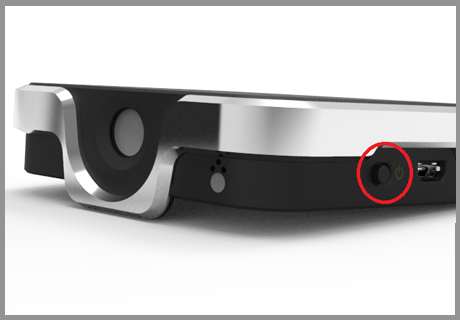 As soon as the device is paired, remember to open the protective cover and reveal the white diffuser over the slit. NOTE: The S/N number is always used to identify the LP that is connection to any APP which is loaded on your smart device. Kindly record the S/N of your LP and keep in a safe place for reference. Place the LP at a convenient distance directly under or in front of the luminaire, make sure the LP is paired and the protective slide is open and tap the MEASURE button. Results will immediately appear on the screen. There is a power function called “SMART Filter” in Spectrum Genius Studio. 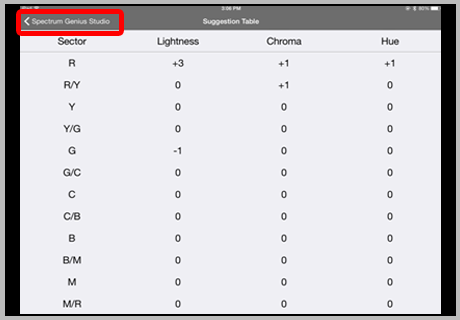 After you got a measurement result or select a result from records, you can tap the “Filter” button to get in SMART FILTER mode. In this page, if you want to turn on SMART FILTER function, please slide the button to right side. ① One is AUTO SUGGESTION. If you turn on AUTO SUGGESTION and input the Target CCT, Spectrum Genius Studio will provide you the best suggestion for which filter you need. ② If you want to use the second mode-Manual Filter Selection ,you have to turn off AUTO SUGGESTION. Then you can choose what you want in the folders below. After the filter is chosen, you can tap the left-top side and back to the main page to see the result. In AUTO SUGGESTION MODE, if you want to check other filter possibility, you can tap “Other Suggestion” Button in the bottom. After measuring, tap SAVE to record the data and input details of the luminaire in your database. ① On the SAVE page you may take or choose a picture of the tested luminaire to be associated with the recorded data. ② The MEASUREMENT NAME is important and mandatory, and it forms the file name of the saved record. Our preference is to include the Manufacturer, Model Number and Date in the Measurement Name for ease of future location. ③ After inputting all necessary information, you can save the data. You may EDIT the saved data when you view the data again if you made a mistake on the initial recording. 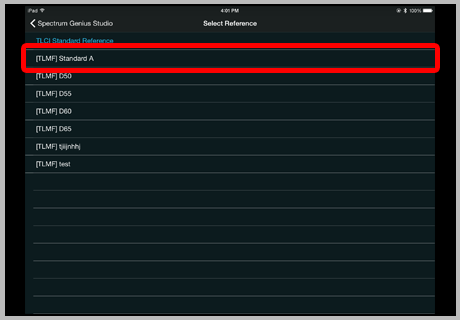 Tap the "Record" icon, you can check your saved measurement data here. To delete any unnecessary saved records, FLICK LEFT and tap DELETE. 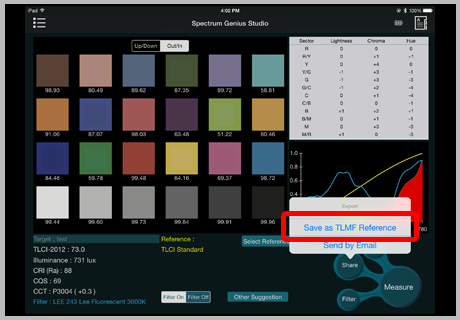 See the KNOWLEDGE base, When taking a measurement, the default reference is automatically selected from the TLCI Standard References based on CCT. If so desired, a user can manually choose a different standard by tapping SELECT REFERENCE. All parameters will change to match this new standard. 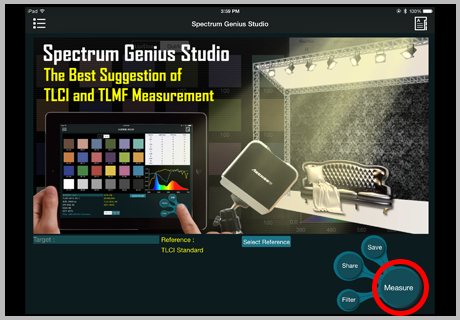 A user can create their own Television Luminaire Matching Factor [TLMF] by saving a measured luminaire. See above, Click on the icon above and then SAVE AS TLMF REFERENCE. Saved measurement data can be emailed to colleagues and customers. Click on the above icon and then click on SEND BY EMAIL. ② The Email default subject name is “MEASUREMENT NAME-MANUFACTURER-MODEL-DATE.AST.” You may also enter your own subject name. The Email includes three graphics [TLCI RELATIVE CORRECTION TABLE, COLOR CHECKER, SPD] and three data files, [.AST, .CSV and .SPD]. ② You can import and edit the .CSV file in Excel. ③ The .SPD file is for importation of saved data into EBU-TLCI-2012 software. “Smart Pass" is a revolutionary function. Users can share their measurement data by email. If the recipients’ smart devices had been installed with SGS APP, recipients can import the data to the APP and use SGS to review the data . 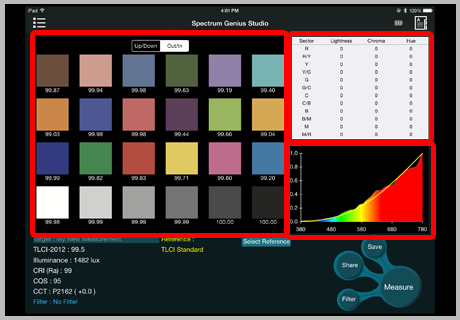 There are two display options for the COLOR CHECKER chart which is in effect a split Macbeth color palette. This is In order to create a visual picture of the reference standard versus the measured luminaire. The options are UP/DOWN [traditional split] or OUT/IN [which uses concentric squares]. However, to get the real visual accuracy one needs a high resolution, calibrated monitor. Depending on the iPad model, the contrast may not be visible. Therefore SGS places the TLCI number under each color to give meaning to the difference. As with the overall TLCI number [Qa] the values for each color vary from 0 to 100 where 0 is a very poor match and 100 is a perfect match. Each of the three graphic charts can be viewed in full screen mode by clicking on them. 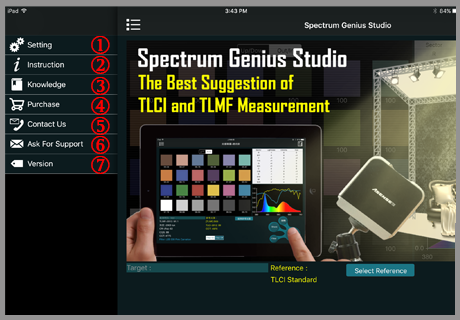 To return to the normal display mode, tap the upper left hand corner SPECTRUM GENIUS STUDIO. ②Instruction – How to use SGS. ③Knowledge – Understanding the basis of TLCI. ④Purchase – To get advanced function. ⑤Contact Us – Email to Asensetek. ⑥Ask For Support – Ask for technical support or report your issues. ⑦Version – See your version number and check on the internet that your version is current. Connected & battery status: It shows the serial number of the connected LP. and the battery status. Clean Device Cache: You can tap it to see your device cache and slide your finger to delete device cache. 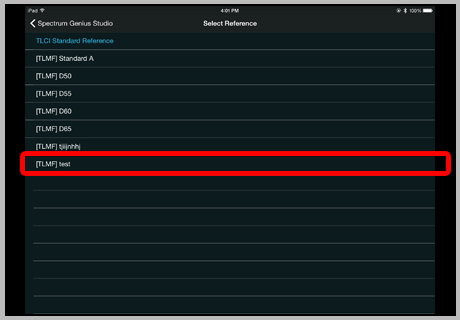 If you click on the "Image Setting", you can switch on the CAPTURE IMAGE option and select the IMAGE SIZE. 100% is recommended. 1, Auto: SGS automatically adjusts to the proper exposure time. 2. If AUTO is turned off, the user can set the integration time manually between 6 and 16000 mille seconds. 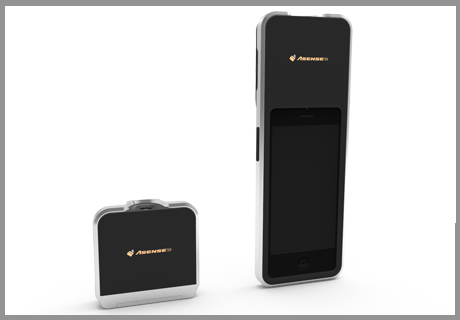 Enhanced the measurement repeatability and accuracy and increased the measuring time. (1) When the light is too intense, it will show this message. (2) Under auto integration mode, the light may not be strong enough, or Light Passport is not placed in a stable position. (1) Lux level is lower than 50 for Light Passport Flagship/Standard. (2) Lux level is lower than 100 for Light Passport Essence.